Labradoodles were created by Wally Conran of the Royal Guide Dogs in Victoria, Australia in the 1980s for the purpose of having a service dog with an allergy friendly coat. The original Labradoodles were a Labrador Retriever and Poodle cross. In Australia in the 1990s other breeds, such as Cocker Spaniels, were brought into the lines to further the goal of producing non-shedding and allergy friendly coats with the service dog temperament. The dogs originating in Australia are now referred to as Australian Labradoodles. They consistently have the wonderful temperaments that do great in roles such as therapy dogs, service dogs, reading dogs, and equally as important, as all around fantastic family pets. They also consistently have the allergy friendly, very low to non-shedding coats that work for most people with dog allergies. Australian Labradoodles are different from other Labradoodles. Labradoodles are a Poodle and Labrador Retriever cross only. They can make fantastic family pets and service dogs as well but they do not have the same consistency in terms of temperament and coat. Australian Labradoodles are many generations of Australian Labradoodles bred to Australian Labradoodles. They will eventually become a purebred but for now we are still working on creating a healthy breed with a large enough gene pool. Australian Labradoodles come in three sizes: miniature, medium, and standard. They have two main coat types: wool and fleece. Wool is non-shedding like a Poodle and fleece is very low to non-shedding with a soft, looser curl. Occasionally a hair coat, like a Labrador, may be produced but this is rare and most of us do extensive DNA testing that can prevent this from occurring. At Sardis Park Labradoodles we breed only the true, multigenerational Australian Labradoodle. Temperament is number one to us. We make sure all of our breeding dogs have the gentle, friendly, loving temperaments that Australian Labradoodles are known for. We also do extensive health testing to ensure we are doing everything within our power to produce healthy family pets and service dogs who will be cherished for many, many years. We love our dogs and we love placing our puppies with select families. Please contact us anytime to learn more about us and our dogs! 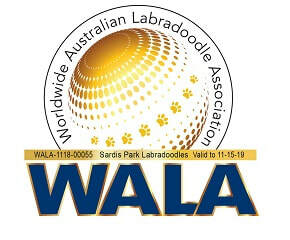 For more information about Australian Labradoodles please visit the website of the Worldwide Australian Labradoodle Association.